I made avocado the star of this dish, but you can also get creative and substitute coconut oil or peanut butter. Looking to make the mixture even more chocolatey? Add cocoa powder, and enjoy! 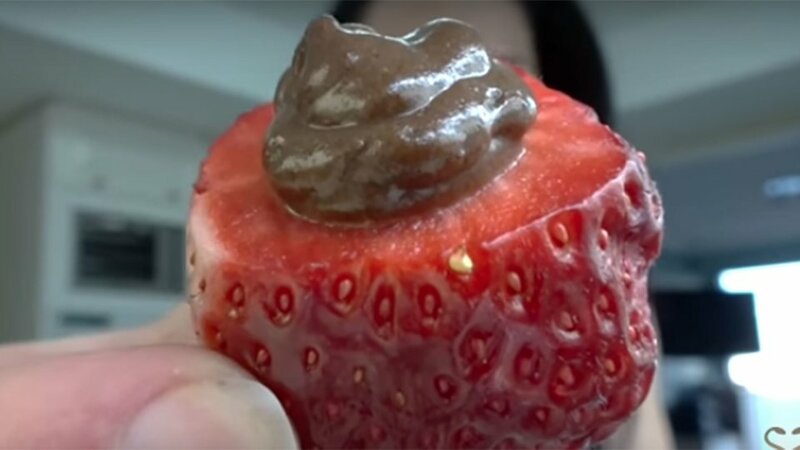 If you don't have time to hull strawberries, just dip them in the pudding. Slice ripe avocado in half, and remove the pit. Place one half into a bowl. Return the other half to the fridge for another day. Mash the avocado in the bowl with a fork until it is smooth and creamy. It should be about 1/3 cup of pureed avocado. Blend with the avocado, adding water as needed. Add stevia or other sweetener. I use Walden Farms calorie-free pancake syrup. Hull 10 medium strawberries, and place them in an ice cube tray. Spoon the pudding into the strawberries or, if you're feeling fancy, create a piping bag by using a Ziploc bag and cutting the corner to pipe in the pudding.